Join me at the studio for our Next Beginner Session! Do something fun with your summer by learning a new skill - how to dance! It helps build a positive attitude and a more confident 'you.' It can also make a great workout plan. Bring a friend and start a new activity! Hip wraps will be provided to borrow. 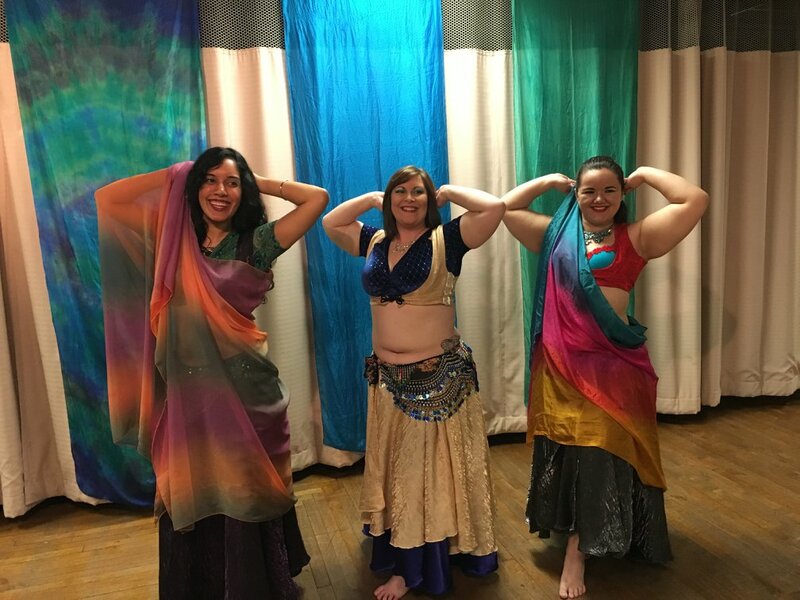 Don’t discourage yourself by thinking “I could never do that,” as belly dance is inclusive to all ages, body types, and fitness levels. If you can count, everything else can be taught! Current beginner classes for ages 17+ only at this time. We take time to make sure all of our students with any physical/health restrictions can enjoy this activity at their own pace. Sign up for your first session that night or any time by phone/email before it starts. The session will run for 6 weeks and covers a variety of basic movements that build on the previous week's lessons to get you used to this new style of dancing. ​Hip wraps will be provided to borrow for all beginner session students. All students are welcome for the new session - please contact the studio at 309-273-9598 or silkroadstudiopeoria@gmail.com for any questions/concerns. For this January/February session, if you prepay (through Paypal) for the class session prior to the start date, the price will be $70. Take advantage of this great deal by emailing the studio at silkroadstudiopeoria@gmail.com to reserve your spot. (Individuals paying the first night of class will pay the regular rate of $80 for 6 classes. Minimum 6 students needed for the class to run). Please contact the studio directly for location/address and payment options – cash, check, and Paypal/Square are accepted.